On-Line Purchase - $22.00 Total...Includes $12.00 ( discounted ticket ) + $10.00 Food Voucher. Members Exchange $10.00 food Discount For $15.00 of Food Tickets the day of the show. NOTE: Within the online process, the word "registration" is meant to indicate a ticket sale transaction. ALSO: Be sure to bring chairs, blankets to sit upon. 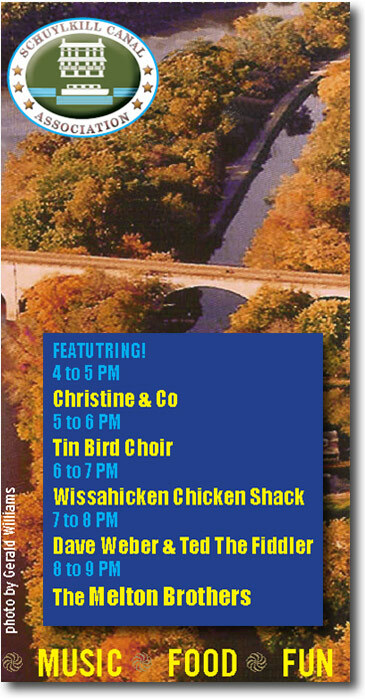 Please join us for an evening of music, food and drink for all to enjoy at the 2010 Schuylkill Canal Association's Fall Benefit Concert & Music Festival. Once again this year, bringing you the very best - The Schuylkill Canal is proud to have the incredible Melton Brothers as the headline act for our 2010 Fall Benefit Concert. Numerous other artists and performers will take the stage as well; please review the details on the concert poster. MEMBERS: Be sure to log into the site (below the main left navigation) to take advantage of the Members Only Concert & Food Voucher Deal when purchasing your tickets. Member's Online Purchase - $22.00 Total...Includes $12.00 ( discounted ticket ) + $10.00 Food Voucher. Members Exchange $10.00 food Discount For $15.00 of Food Tickets the day of the show. This is a Rain or Shine event. Regardless of the weather it will be a great time - great music, good brews and food and lots of fun. The music will be set up under the large pavilion in St. Michael's Park with plenty of room for dancing and camaraderie for all !